Made for Avon by Fostoria in the 70's around our bicentennial. 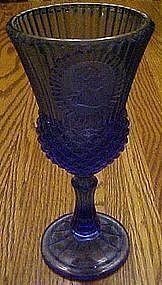 This lovely cobalt blue goblet has a frosted cameo of George Washington. Measures 8 1/4" tall. Perfect condition. I have 6, price is for each. I also have Martha listed.